Book 1 of the 'Lucy' series is set in 1970s England and tells of eight-year-old Lucy, who has lived most of her life locked in a small closet until one day her angry stepfather takes her into the woods and abandons her. One might think that, like Hansel and Gretel, disaster will come of this move; but in fact Lucy thrives in her new wilderness world outside of the closed-in room that has been her life. In the process of adapting to the outdoor wonders she has only read about in books, she comes to feel a new kind of freedom and appreciation for life. Despite her friendship with a boy who helps her, and her ability to adapt, Lucy's not out of the woods yet: when authorities discover a child living alone in nature, they 'rescue' her and take her to an orphanage where, once again, she is bullied and abused. One notable feature of Lucy in Her Secret Wood is its focus, not on the abusive situations, but on Lucy's sense of wonder as she discovers the good in her world. Her closed-in life serves, in this case, as a backdrop for the sense of appreciation she evolves for nature (wild though it may be), and the focus is on this sense of growth and discovery and not just upon the abuse she endures. Gorgeous color paintings enhance the feel of Lucy's woods experience and the comfort it involves, while dialogue throughout reflects Lucy's respect for the newfound world she moves through. Now, all is not sweetness and light in the woods: Lucy discovers she lacks and requires very basic survival skills despite the efforts of her new friend's help, and in the course of her explorations, she learns survival and problem-solving skills. As advanced elementary to early middle school grades read about Lucy's evolution, it becomes evident that her story is about more than abuse, escape, and an appreciation of nature: it's about healing, recovery, and how to maintain a sense of wonder and appreciation of surrounding beauty. In this respect, Lucy in Her Secret Wood offers an appealing window of opportunity for kids of all ages to reconnect with the world, use art to express these connections, and ultimately arrive at better places in life where hopes, dreams and promises do come true. 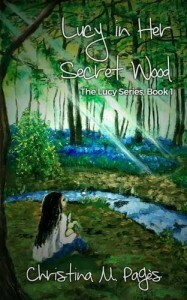 Lucy in Her Secret Wood offers a message, not just of survival, but how to choose positive paths that wind through the world's negative influences, making it a recommended children's novel for many reasons.